Julen Lopetegui has announced the final 23-man squad for Spain and the image below is the official announcement of Spanish Squad. Alvaro Morata misses out on the world cup while Aspas, Rodrigo, Lucas Vasquez and Asensio joins Diego Costa in the final 23 man squad. 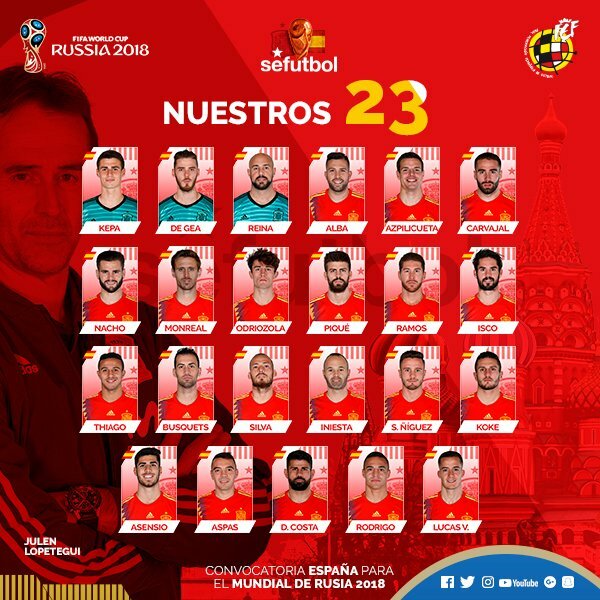 Spain 23 Man World Cup Squad Confirmed: Spain’s confirmed final 23man squad is listed below with couple of surprise inclusions in Alvaro Odriozola and Lucas Vazquez as Morata misses out in the final squad. Spain will be one of the favourites to go all the way in 2018 world cup under new coach Julen Lopetegui who was a surprise appointment back in 2016 after Vicente Del Bosque retired from international coaching role. Spain have been doing pretty well under Lopetegui since he took over and he has been forced to change from that famous 4-3-3 system to more of a 4-5-1 due to lack of quality wingers. Lopetegui do have to improvise with his team selection as the squad is not as talented as it used to be. David De Gea is surely set to start in goal for Spain after his incredible form over the last few seasons. Jordi Alba and Dani Carvjal/Cesar Azpilicueta as full backs. Sergio Ramos and Pique to continue playing in central defense roles. Sergio Busquets to start as defensive midfielder with Saul Niguez and Thiago Alcantara taking central midfield roles. Spain do not have proper recognized pacy wingers and we can expect Isco and Koke to start on either side of the flanks and depending on match situations Marco Asensio and Suso can be used as forwards in three man attack . Diego Costa is surely first choice striker with Alvaro Morata as back up. Asensio is still young and might not start every game but he is a player who might surprise a few one given a chance. Already a first team player at Real Madrid scoring in the Champions League final he certainly have what it takes to be a first team player with national team. Suso is another name currently playing at Milan who can be used as right winger and behind the striker.